So in the past year I tried cutting out wheat completely to see if that was the jump start I needed...it wasn't. I've also tried upping my fats to see where that got me..that's been helpful (more fat in my diet = less fat on my body!). I've tried reducing carbs and found extra energy levels and I've upped my protein for even more energy and more muscle building. After looking at everything that's worked and what hasn't, I have decided to move more and more towards a Paleo lifestyle. Paleo loosely tries to follow what our cavemen ancestors probably ate. I say loosely because there is no 100% agreed on diet of cavemen and perhaps even more importantly, there isn't really an agreed upon era that Paleo eaters are supposed to create their diet from. Scientists will argue that this doesn't make for a good diet plan but I say who cares? It makes sense to me because what there is evidence of is that the more grains and agriculture become staples of our diet, the less healthy we became. This is particularly pronounced in the last century where grains, particularly wheat, and particularly the frakenwheat (dwarf wheat) we grow in America, have come to make up an unwholesome percentage of our diet. We are consuming more frakenwheat, more soy and way more corn than anyone before us ever has. And we're fat...like really really fat. So to me, that's enough to at least stop and question if there Standard American Diet (SAD) is really the best option. What will I be eating? True Paleo would say no sugar, no or very limited alcohol (red wine only), no grains at all, no beans/legumes (bye bye peanut butter!). The focus is on grass-fed, organic meat (true Paleos also don't shy away from organ meat, more squeamish eaters like me do! ), lots of veggies, some tuberous veggies (like sweet potatoes) and limited fruit and nuts. Some Paleo eaters eat dairy, some don't and that's mostly left up to how one's own body handles dairy. 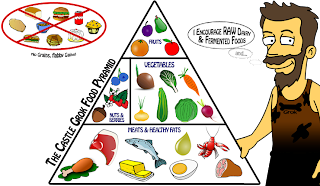 For me, I will be eating meat (grass-fed when I can afford it, supermarket special when I can't), eggs, veggies, fruit (not limited), nuts (limited only by the fact that I am extremely aware how fast those calories add up), limited dairy (Greek yogurt, some cheese) and occasionally natural sugars and very occasionally alochool. I am also not giving up my whey or casein protein! Much like I was talking about in Monday's post, I am not making bold claims or never eating this or that again. I am just going to focus on the good, whole foods, particularly the meats and veggies and hope the rest falls into place. Because let's be honest, I am going to have frozen yogurt again...in obscene quantities (if you haven't yet, check out my Instagram pics of my unwholesome obsession with frozen yogurt - FatCityFit). Have you heard about Paleo? Tried it? Like the idea? Hate the idea?